SLR_Week8_SnowLast week we had our first above freezing SLR since January. It wasn’t snowing. Some of the streets were cleared. Besides a near-rumble with an aggressive plow driver in his pickup truck things are looking up. This week I have to find a new 18 mile route for you. The planned one goes through Breakheart. I’m sure this isn’t the first time the Breakheart route hasn’t been runnable this far into the season, but I don’t recall my plan to adapt to that. For those that have ventured near Breakheart, is the flatter side even runnable? I’m planning on no, but let me know if its as easy as changing the route to “just run the flat side to the Voc and then come back”. Other than that stay tuned for the route. Water stop help… I’m assuming I need at least two helpers wherever we run. Who wants to help? That’s all I have for now. This post will be edited with more information about our first run of March 2015… you know, the month where we get above freezing regularly, snow melts, Easter Springtime and Boston are just around the corner. That March. Goodbye February… we’re not gonna miss ya! Who’s in for the Mystery March 1st SLR Route? Roll Call. Having driven around the area a few different ways, I really can’t find a good continuous route. We’ll keep the plan simple, Spot Pond + Lake Quannapowitt. We’ll leave Brueggers south on Main Street to a right on West Wyoming. Follow past Grimsby’s and up Pond Street to Spot Pond. Go left onto Woodlawn Rd along the front side of Spot Pond. Find the first water stop at Flynn Rink. After the water stop go right on Elm Street. At the end of Elm go right on Main St/Rte28. Follow this into Stoneham. Turn right at Straw Point and cut through the parking lot over to South Street. Right on South will bring you onto Pond Street and past Stone Zoo. The sidewalks will open back up at the zoo where you’ll keep going until you get to the left on Pond Street that will bring you down to Grimsby’s. You’ll find a water stop there. After that stop run out along the LynnFells Parkway over to Melrose High School. If you’re running the half route turn right on Main Street and head back to Brueggers for an 8.5 mile run. Running long, turn left on Main Street and head to Wakefield. You’ll find the next water stop on your right at Nick’s Pizza. After Nick’s run along Main Street along the east side of Lake Q. Turn left at the end onto Lowell Street, then left onto Quannapowitt Parkway to cut over to North Ave. Take a left on North Ave and follow that all the way back to Nick’s Pizza for more water. After the last water stop head back along Main Street to Brueggers for 18 miles. Week 7 – What will Pandora Bring? Last week winter storm Neptune brought us more snow, a lot more snow, washing out our Sunday in a sea of white. To beat the storm we ran on Saturday morning despite a starting temperature of 1 degree and an ending temperature of 12 degrees and a stern warning from an elderly gentleman in Brueggers explaining how dangerous it is to be running. We adjusted the route due to giant snowbanks and we moved a water stop due to narrow roads, but more than a dozen runners that showed up made it through safely. All the long runners opted for the hills of East Border Road and the Fellsway East to avoid some of the unsafest running along Woodland Road. Thank you so much to Jannel, Jackie and Christopher, and Sue for coming out and braving the frigid air to keep the runners fueled throughout their run. Another week has dropped some more snow on the roads of Melrose and Stoneham, but I’ve seen the snow bank shaving truck out there widening out streets. I’m not sure if they’ve done Franklin yet but I know West Wyoming has been widened. I also hear the sidewalks of Spot Pond have been somewhat plowed out. So this week I think the route stays the way it is. That’s the good news. The bad news is winter storm Pandora is on its way. Named after the first human woman in Greek Mythology placed on earth by the Gods. The myth tells of how she opened a jar out of curiosity to find what was inside. By doing so she unleashed all the evils of humanity. Like the myth this storm is predicted to bring all the evils of winter weather to New England, rain, snow, and sleet along with wind. Which one will be happening during our running hours, I’m not sure. Whatever it is, this run will likely be a test. But when Pandora closed the jar there was one thing left inside… hope. So lets get through this one and hope not just for better weather, but for great races this spring after all the adverse training you’ve been through this winter. Lets go over the run: Like last week we’ll start out Main Street heading north towards Ell Pond. Past the pond, continue on Main Street up to Franklin Street. A left on Franklin will take you into Stoneham all the way to Stoneham Center. Take a left on Main Street and follow it all the way to Friendly’s. There will be a water stop at the parking lot of Friendly’s on your right. After the stop, running the half route you’ll turn left on South Street and head up past the Stone Zoo. Turn left on Pond Street to head towards Grimsby’s. At Grimsby’s turn left and run along the LynnFells Parkway past Melrose High School. Take a right on Melrose Street and a right on Main and head back to Brueggers for a 7.2 mile run. Running long? Continue on Main Street after Friendly’s around the back side of Spot Pond. Turn left on Elm Street up to the rotary at Highland Ave. Turn right on Highland and run all the way to the Fellsway East rotary. Somewhere on Highland, near the Fellsway East, will be a water stop. After that stop go the rotary and turn left on the Fellsway East. Chug up and down those hills to you get to Grimsby’s. At Grimsby’s turn left on Pond Street and head up to Spot Pond. 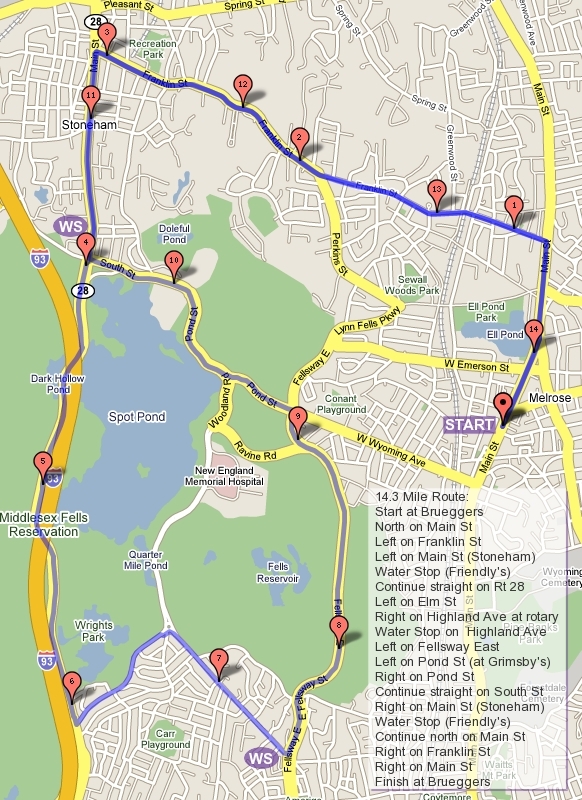 Turn right and run past the Stone Zoo and back to Friendly’s where there will still be a water stop waiting for you. From there you’ll go back the way you came, Main Street in Stoneham, right on Franklin, back into Melrose, a right on Main and back to Brueggers. Water Stops. There are only two water stop locations so I can get by with one helper this week. Who’s it going to be? Who’s up for running through whatever Pandora unleashes on us? ROLL CALL! While a handful of runners made it out in the snow last Sunday and got 10-12 miles in, Mother Nature is stepping it up a notch to test people even further. Saturday will be very cold (single digits, crazy windchill) but there will be no snow. Sunday will most likely be a blizzard. The winter training season from hell continues… but you runners are tough! So the plan is to change the Sunday Long Run to Saturday. We’ll also get an earlier than usual start, 7AM. We’ve run on Saturdays before and my biggest worry has been traffic. There is a substantial increase in cars on the road on Saturday morning versus Sunday morning. With towering snow banks everywhere you need to be extra careful out there. We’ll stick to the planned route and do our best to have water stops in the normal places. We’ll meet at Brueggers at 7 and head right out. The route takes us up Main Street and out Franklin Street to Stoneham. The first variation is to to take Franklin Street all the way to Main Street in Stoneham, do not run on Summer Street, its too narrow on a good day! In Stoneham Center take a left on Main Street. Follow that to the intersection (it has a set of lights at it) of Main, Summer, and Marble. Take a right on to Marble Street. Marble will turn into Forest Street as you cross I93 and enter Winchester. The first water stop will be on your left at Eugene. Running the half distance? Turn around and head back. The route has you turn right on Park Street and pass Friendly’s and the Stone Zoo before taking a left on Pond Street down to Grimsby’s. Follow West Wyoming to Main and finish at Brueggers. In for the Full? Keep running down Forest Street into Winchester. Turn left on Highland Ave and up a hill to Winchester Hospital. Turn left on Reservoir Road and take in the snowy landscape along the northwestern edge of the Middlesex Fells. This is my favorite street in all the SLR routes. Of course it’ll probably just look like another snow bank to you. Reservoir Road will bring you back to Highland Ave. Left on Highland, follow that through a five way intersection, going straight across and up a hill, and keep running to the end of Highland. There you’ll find water stop 2. After that stop you turn right on Main Street, Rt38,. This takes you to a rotary. As you follow the rotary counterclockwise there will be a small street followed by a major street. Turn right onto the major street. This will bring you to another 5 way intersection. Cross the Mystic Valley Parkway and bear to the right on Washington Street. If you pass a church you’ve done well, if you pass Winchester High School you went the wrong way. If you don’t pass either… good luck to you. Follow Washington Street to Forest Street, you’ll know you’re there when you see the Gingerbread Construction Company at the intersection. Turn right onto Forest and head back up some hills… some big hills. At the top of the hills you’ll be back at water stop 1 but now it’ll be water stop 3. After that the plan has you running over I93 and turning right onto Park Street. Park Street will take you to Friendly’s. At Friendly’s turn right and run the backside of Spot Pond on Main Street, Rt28, in Stoneham. Turn left on Elm Street. Turn left on Woodland at the rotary and find the water stop at the Flynn Hockey Rink parking lot. Now here you have an option. The route has you run Woodland to Pond, turn right on Pond and finish up by continuing on West Wyoming and turning left on Main Street. Woodland was troublesome last time we ran it, and there’ll be more traffic at this time this week…. and still no sidewalks. So from here you could head back to the rotary, continue on Highland, turn left on the Fellsway East and make your way through hills to Grimsby’s. The roads should be a bit wider, but this will be a little longer and hillier. I’ll leave that up to you. Jannel has graciously volunteered to do the water stop again. I believe Sue Clough will also help out. I will be out and about as well. Any questions? Who’s in for the cold but not snowing Valentine’s Day Edition Saturday Long Run? 7AM Brueggers! Roll Call…. Ok, I’m still trying to figure out the plan for this weekend. We have narrow streets and giant snow banks to deal with, and if that’s not enough we have a prediction for more snow. The tradeoff is whether we change the run to Saturday before the next snow storm but in frigid temperature and more cars on the road, or….. stick with Sunday and run in more snow, deal with some plows but less cars on the road. On top of that I’m wondering about where to run. There is the planned route which is along major roads for the most part, or we keep it local and run up and down Main Street a few times. Again, I’m still pondering and will post again tomorrow if we’re changing to Saturday. Experience tells me to hold off on changing the day, but this winter is different than past experiences. Feel free to weigh in with your thoughts? Last week we had over 30 people show up for a run in frigid temperatures and post-blizzard snow covered roads. It wasn’t easy, but hugging the side of the road, you got your training run in. Surprisingly, post-run, Brueggers was filled with smiling faces. Its as if you like the extra challenge! Nicely done. You would think things would be easier this week. After last weeks run, most of us settled into watch a great football game in which the local team walked off the field as Superbowl Champs. Like the city of Boston did, I’ll encourage you to ignore the snow and revel in the Superbowl Championship as we have our own little parade (of runners) this week. Since Breakheart is covered in 4 feet of snow, we won’t be running through there this week. If you click on the map and scroll down, there is a second map. This won’t be the first time we’ve had to divert over to the snow route. I’m guessing we’ve actually run the alternate route more than the Breakheart route. The alternate route is Farm Street/Pine Banks. We’ll head out Main Street as if we’re going to Breakheart, up past Ell Pond (I doubt we can see the Clarence DeMar monument in all this snow, but nod as you go by). Veer right onto Green and at the lights turn right onto the LynnFells Parkway. Run Safe, single file. A mile down the road or so you’ll hit a set of lights, turn left and head up Main Street in Saugus. Long runners go straight until it becomes Farm Street and look for a water stop on your right at Wakefield High School. Half runners look for a quick water stop as you quickly turn onto Howard Street at the first set of lights. The half route will follow Howard to Green until you find the LynnFells Parkway again. Turn right on the Parkway and follow it past Melrose High School and up to Grimsby’s. Turn left on West Wyoming at Grimsby’s and follow that to Main. Left on Main will take you back to Brueggers for 6.3 miles. The full route will leave the water stop continuing on Farm Street. At the end of Farm turn left on Water Street. This street will be tough to manuever with the snow. Stay close to the side of the road! Water will take you to Wakefield Center. Go right at Main Street and follow Main back into Melrose. Pass Main Street and watch for a water stop along the left hand side somewhere safe after Brueggers (maybe by Montvale Tire). After that stop continue on Main Street past Pine Banks Park into Malden. After the park you’ll hit a set of lights at Forest Street. Turn left there and follow Forest to Lebanon Street. Left on Lebanon and then left on Sylvan will bring you back to Main Street. Right on Main will bring you back to Brueggers. Safety: Again the roads are very narrow due to all the snow. Please run smart, run safe, be visible but stay close to the side of the road. It will probably be cloudy and possibly snowy so remember visibility is not good. Also remember that many drivers are nice and are paying attention. Some are rude to runners and will even make the situation more dangerous than they have to be. Be ready to jump in a snowbank if you have to. Water Stops. A helper would be good. Anyone? There will be some improvising to the stop locations this week. Runners be wary you might find me in places you don’t expect me with the change in the route. There may be someone at Nicks, the Melrose Center stop may be anywhere along Main Street. Stay aware. Ok, that’s all I’ve got. Who’s ready to tackle the winter miles once again? ROLL CALL!